Dana Waters is the owner and broker of Dark Horse Realty, the company he started in 2001. Dana provides incredible service to buyers and sellers of all types of properties. 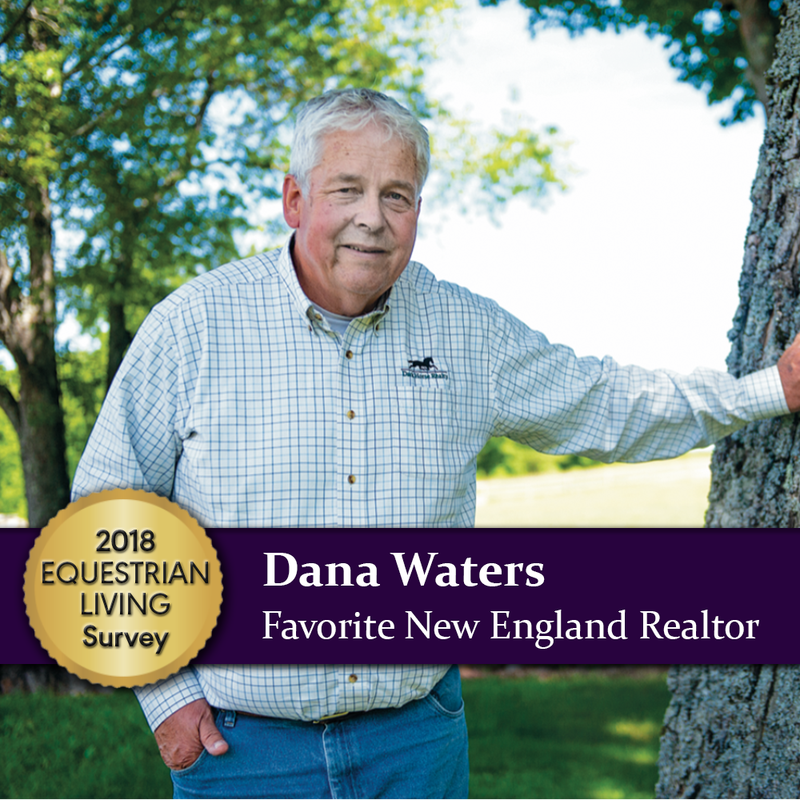 2018 Favorite New England Realtor: Gold medal winner of the Equestrian Living Magazine Gold List reader’s survey. 2016 Realtor of the Year: Dana Waters was honored as National Association of Realtors Windsor County Realtor of the Year in 2016, as chosen by his peers. Good Neighbor Award: Dana received the Windsor County Board of Realtors 2015 Good Neighbor Award for his volunteer work in the community. Waters received the award at the Vermont Realtors Achievement Awards dinner and was presented with an official award plaque at the Windsor County Board of Realtors annual meeting. Dana is a key member of the local community, working hard not only for his real estate clients but volunteering for several non-profit groups. Currently, Dana is president of the Reading/West Windsor Food Shelf and has served on the board since 2011. Dana is also active in the Windsor Rotary Club and the Green Mountain Horse Association. He’s served as past president and longtime member of both organizations. He’s frequently seen doing trail work to preserve local equestrian trails, selling penny sale tickets, and helping his clients new to the area become a part of the community. Dana became a Vermont resident in 1998, when he made the move from Boxford, MA with his wife Paula and two sons. Prior to making Vermont their home, Dana and his wife Paula visited Vermont frequently to enjoy the area and the equestrian trails surrounding the Green Mountain Horse Association. In Boxford, Dana was the owner and manager of Waters Insurance Agency. Dana opened Dark Horse Realty in 2001 and began serving buyers and sellers of Vermont real estate. Dana enjoys working with buyers and sellers on properties of all shapes and sizes. He’s helped many first-time homebuyers find the right property, and navigate the process of purchasing a home. Known for his extensive knowledge of the real estate business and the local area, Dana works tirelessly to assist his clients with all aspects of their purchase. His friendly way, desire to help, and work ethic make Dana the go-to guy for any Windsor County Vermont real estate needs. Having Dana Waters as my agent has been a very profitable experience for me. Dana takes the time to understand my goals. He is a skillful negotiator for his clients. I have witnesses Dana’s integrity on many occasions. Making clients happy with their acquisitions for years to come is his goal. He wants to be your neighbor. We had many obstacles for the sale of my house. Other professionals had us jumping through hoops. I was ready to give up and move on, but Dana Waters knew the buyer wanted the house. He went out of his way many times to seal the deal! Working with Dana Waters on the sale of our property was a very positive experience. Living two states away, it was important to have someone diligent and trustworthy working on our behalf. Dana was very attentive to every detail and went above and beyond for us to ensure a smooth closing. He did a fabulous job! I am pleased to recommend Dark Horse Realty. We knew our family had outgrown our house and needed to move on. You created a path that allowed us to move on very quickly and in the most profitable way. Dana kept us focused and excited about selling the house and moving forward. Thank you for sharing your knowledge and professionalism!